Harold G. Renner, Jr., 78, formerly of Bangor, passed away suddenly on Thursday, July 14, 2016, at Chandler Estates in Plainfield Township. 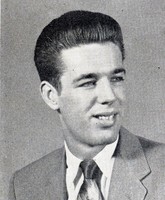 Born in Wilson Borough on March 11, 1938, he was a son of the late Harold G. Sr. and Dorothy (Fagan) Renner. He was a graduate of Easton High School’s 100th graduating class in 1956, and played on the football and basketball teams. A 25-year member of the International Brotherhood of Electrical Workers Union Local #603, Harold was employed by Metropolitan Edison Co. in Easton and Forks Township where he began his career as a grounhand and retired after 37 years as a supervisor of lines. He was an avid sportsman and played American Legion and Tri-County baseball for 4 years, as well as basketball in Easton and Nazareth City Leagues from 1956 to 1965. He also played quoits in Bushkill and Delaware Quoit Leagues for 25 years. Harold sang with the Festival of Harmony in Wind Gap for 18 years, which supported cubscout activities, as well as singing with the Bangor Elks Men’s Chorus for 20 years assisting Elks charities. In addition to volunteering, Harold enjoyed boating, birdhouse building and watching, and gardening. He was active in freemasonry and a member of Bangor Lodge No. 565, F&AM as well as Portland Lodge No. 311, F&AM. Harold was also a member of the Bangor Elks Lodge No. 1106. Survivors: He will be lovingly remembered and dearly missed by his three children, Randy Williams, Sr. and his wife, Christina M. of Emmaus, Cece Romano and her husband, Paul of Pen Argyl, and Pamela Petrushka of Nazareth; three grandchildren, David and Matthew Petrushka both of Nazareth, and R.J. Williams of Emmaus; a great-granddaughter, Isabella; two brothers, Robert Renner and William Renner and his wife, Dale both of Easton; former wife, Darlene A. (Wagner) Renner of Nazareth; and two nieces. Harold was predeceased by a son-in-law, Robert Petrushka in 2013. Services: A Memorial Service in celebration of Harold’s life will be held on Wednesday, July 20, 2016, at 3:00 P.M. in the GEORGE G. BENSING FUNERAL HOME, Inc., 2165 Community Drive, Route 946, Village of Moorestown - Bath, PA 18014. Friends and relatives are invited to call on Wednesday afternoon from 1:00 P.M. to 3:00 P.M. with a Masonic Funeral Service at 2:30 P.M. in the funeral home. Interment will be private. Contributions: may be made in memory of Harold to Safe Harbour Easton, 536 Bushkill Drive, Easton, PA 18042.